Last night, an Oakland Public Ethics Commissioner said he's certain that officials are abusing the privilege of free tickets to Warriors and Raiders' luxury suites. “The only reason they’re going is to enjoy the liquor and the food,” Commissioner Stephen Shefler said during an informational hearing at City Hall. “These people are 99.9 percent enjoying the game and one-tenth of a percent of the time doing oversight." He added that residents have a right to be angry about this misuse of free tickets. 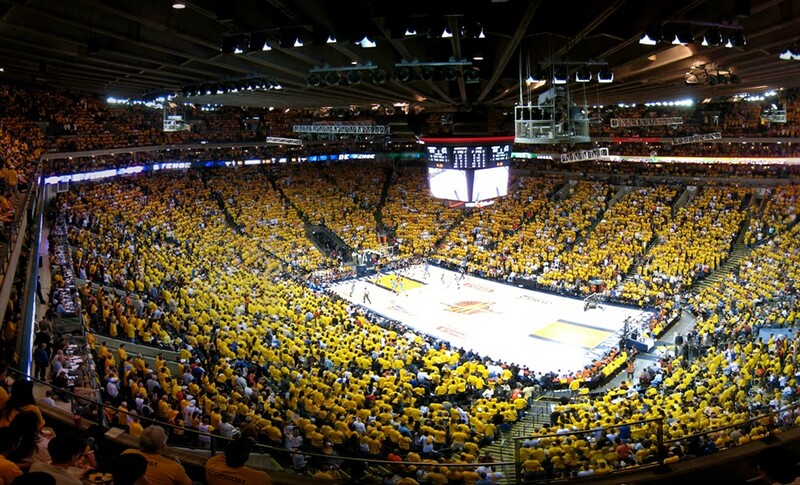 After a series of media reports earlier this year accusing local officials of hoarding Warriors tickets and even doling them out to cronies, the Oakland PEC agreed to investigate the city and county’s methods of distributing tickets for all events at the Oakland Coliseum and Oracle Arena. But despite this ongoing investigation and public uproar, the number of request for free tickets have not abated. For example, Council members Dan Kalb, Lynette Gibson McElhaney and Abel Guillen reportedly have two-tickets each for tonight’s Warriors game versus the Houston Rockets. Wednesday’s hearing was not part of the investigation, according to the commission’s vice chairman, Marc Pilotin, but instead a discussion of ways to reform the process in the future. As part of the licensing agreement between the Coliseum Joint Powers Authority, which oversees the complex, and the three sports teams that use the facilities, a total of three suites are available to every event. This comes out to 20 tickets at Oracle, which primarily houses the Golden State Warriors, and 18 tickets for games and events at the Oakland Coliseum. Officials are supposed to use the freebies to oversee facility operations. But critics say this rather large inventory of tickets allows city officials to essentially become de-facto season-tickets holders on the public’s dime — or even curry favor from potential campaign donors. Councilmember Larry Reid, who often sports a floppy Raiders cap to Oakland Coliseum Authority meetings, is one of the most frequent ticket users, according to the PEC. He requested tickets for events 356 times over the past three years. Council members Gibson-McElhaney and Guillen also often request tickets for events. Scott McKibben, the executive director of the Coliseum Authority, told the commission last night that each entity involved in overseeing the complex — the city, county and JPA — distributes the tickets on their own. Typically, each official is limited to two tickets per event, and on a first-come, first-serve basis. In addition, once officials receive the tickets, they are required to declare to the California Fair Political Practices Commission, along with a reason for the transaction. However, there is no record of who actually attends the event. The value of the luxury suites varies. At Oracle, they range from $150,000 to $400,000 a season. And suites for the Raiders go for up to $75,000. McKibben had used 85 free Warriors tickets, worth $255,800, in three years, according to an investigation by the East Bay Times. Officials are supposed to attend events to oversee venue operations. But some commissioners strongly questioned whether this was actually happening. “How long does it take to oversee the operation of a facility?” asked Commissioner Dana King. King at times was incredulous. “Members of the marijuana commission are not getting free pot. The Art Commission doesn’t get free works of art. Why does this commission get free tickets?” she asked. During a contentious moment, McKibben refused to place judgment on how much time an official performed oversight versus watching the event. A representative from the FPPC told city commissioners that state law does not require disclosure of such details. In addition, additional oversight public officials' use of tickets is not on the FPPC’s radar at this time. It's unclear how many staff hours are dedicated to management and allocation of free Warriors and Raiders tickets. JoAnne Speers, a professor of ethics at the University of San Francisco, said public officials have a duty to be stewards of public resources, including tickets to events at facilities it oversees. Even the slightest appearance of misuse is damaging to the public’s trust, she added. A better distribution policy would focus on using tickets to spur economic development, rewarding employees for good work, and allow underprivileged youth and community groups, who might not have access to games and concerts. Allowing a single person to dole tickets might also help with oversight, Speers said. Elsewhere, city officials in Santa Clara refused access to tickets at the new Levi’s Stadium, which hosts the 49ers and other large events — perhaps recognizing the pitfalls that can arise from free tickets. However, in the state capital, Sacramento, the city actually owns a suite at its new arena for the Kings. Nearly two-dozen tickets, at a value of $200 a pop, are available for every event, and the city intends to delegate a full-time employee — at a $100,000 salary per year — to be in charge of ticket allocation. There is an emphasis on giving those tickets to nonprofit groups, however.